Faber Piano Adventures. Educational, Method. Softcover. 48 pages. Faber Piano Adventures #FF1079. 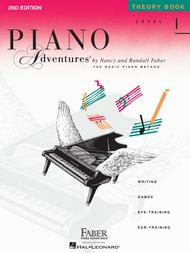 Published by Faber Piano Adventures (HL.420172). Muy bueno para los niños que empiezan piano. January 11, 2018 Love the cover. I have used this piano method for many years with my students. I love the presentation of the musical concepts. They are easy for students to grasp and they enjoy playing the pieces. It allows them to learn in a sequential manner and succeed. I just love the Piano Adventure series! I use the lesson, performance and theory book together to provide a rounded lesson experience. The kids love these songs and the theory is perfect for reinforcing the lessons learned. Faber Lesson and Theory books are a no-fail combination. Fun to use. 34 of 72 people found this review helpful.